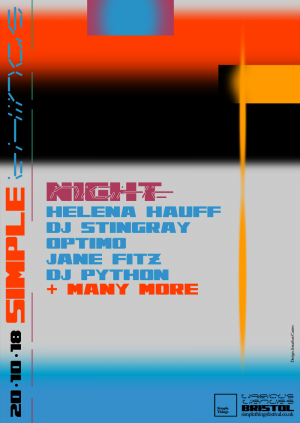 For the nighttime programme, Simple Things will take over the Lakota complex with six rooms of music situated firmly at the sharp end of DJ and dance music culture. Current Mixmag cover star Helena Hauff headlines the main room with her hyper in-demand blend of uncompromising electro, EBM and techno clatter. A perfect accompaniment, Detroit electro mainstay and Drexciya affiliate DJ Stingray appears alongside. Room Two showcases one of the most revered contemporary labels operating today – Whities. Nic Tasker’s label is defined by a spirit of imagination and innovation, specialising in unique, curveball records that expertly toe the line between experimentalism and functionality. Alongside Tasker will be a special live performance from Bristol favourites Giant Swan, plus DJ set from Minor Science, Coby Sey and Deena Abdelwahed. Elsewhere in Lakota, Bristol label Wisdom Teeth curates Room 3 with a line-up of psychedelic, broken-beat and sub-heavy techno. The bill is topped by rising US star DJ Python, whose 2017 debut album Dulce Compañia introduced the world to his singular ‘deep reggaeton’ sound. Python is joined by Björk-endorsed club experimentalist LOFT, local heroine Anina, and Wisdom Teeth label-head Facta, whose most recent release saw him joining the ranks at kindred Bristol imprint, Livity Sound. Futureboogie return to the Coroners Court with Glasgow selectors supreme Optimo and the brilliant Jane Fitz, with Studio 89 also taking up their usual space in the second Coroners Court with rising talent Mafalda headlining. The rest of the nighttime line-up is completed by Gramrcy, Em Williams, Dave Harvey, Eris Drew and Studio 89 DJs.